With the ability to reduce the risk of cavities by 80%, as noted by the American Dental Association, dental sealants are the safe way to stop decay. In essence, sealants are placed over the occlusal (chewing) surfaces of back teeth in liquid form before being “cured” with a chemical or light. For teeth with deep fissures or grooves, sealant material forms a barrier against decay and bacteria. 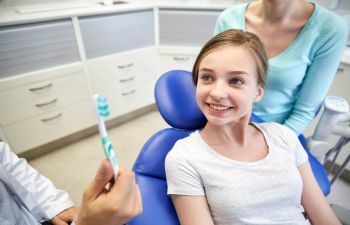 Thus, dental sealants have become an important preventative measure for children, as well as those with deeper fissures or grooves and individuals with an increased risk of developing tooth decay. To place dental sealants, dentists first begin by cleaning and drying the tooth before “roughening” it with an acidic gel. This is a painless process, and ensures that the sealant material adheres properly. The gel is then rinsed away, and the sealant material is painted over the grooves of the tooth. As the material “sets,” it fills in the tiny crevices of the tooth that trap bacteria. In some cases, a light is used to harden the sealant. As mentioned, dental sealants have long been an important preventative step for children, as the material fills in the tiny spaces of teeth that trap bacteria. Though it’s ideal to place sealants early, as soon as the first permanent molars erupt, adults can benefit from them as well. In fact, some sealants can be placed overtop areas of mild decay. Given that the sealant material is clear, the dentist can monitor the tooth to make sure that the sealant is keeping tooth decay at bay. While there is no substitute for good oral care and regular dental checkups, dental sealants are a powerful tool used to amp up one’s oral health routine. With this in mind, it’s easy to see why dental professionals place a high value on dental sealants as a vital component of preventative dentistry. As your trusted, family-friendly dentist in Kennesaw, Marietta, Acworth and surrounding areas, Kennesaw Mountain Dental Associates provides top quality dental care for patients of all ages. While we understand that adults and children look for different things in a dental practice, we realize that dental sealants are a tried and true dental service for any age. To learn how dental sealants can advance your oral health, call Kennesaw Mountain Dental Associates today. Understanding Temporomandibular Joint DisorderWhat Is a True Dental Emergency?